Atheists are suing a state senator for blocking them on social media. Unhitch From the Ten Commandments? No. 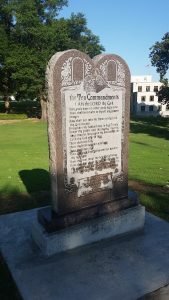 Last month we wrote about the unnecessary controversy surrounding Arkansas’ monument of the Ten Commandments. You may recall a group parked a satanic statue in front of the Arkansas Capitol Building for a short time to protest the state’s monument of the Ten Commandments. As a result, more than a few Christians questioned whether or not the state should remove the Ten Commandments monument from the capitol lawn. We have written about why that’s a bad idea. Today our friends at the Colson Center for Christian Worldview have published a commentary explaining why the Ten Commandments are still important for us today. What’s the only passage in Scripture personally written down by God? If you answered “the Ten Commandments,” you’re right on the money. Exodus tells us that God audibly spoke these laws at Mount Sinai and inscribed them on tablets of stone with His own finger. Of course, that’s not the only reason the Ten Commandments have a central place in the Judeo-Christian tradition. Christians have long understood them to be the clearest expression of God’s eternal moral character. Not to mention, they played an instrumental role in shaping Western civilization, including forming the foundation of our legal system and our understanding of justice. It’s why Moses and those tablets can be found at the apex of the U.S. Supreme Court. . . . The moral principles expressed in the Ten Commandments didn’t come into existence at Sinai. They’re part of God’s eternal character which He built into the very fabric of reality itself. Even more, Jesus relied on the Old Testament throughout His ministry and in His teaching, especially when making the moral case for something. The reason, from a Christian worldview, is clear: Whether we’re talking about the moral principles expressed in the Ten Commandments which Christ perfectly kept or the ceremonial regulations of Leviticus which foreshadowed our perfect High Priest, all of the Old Testament is relevant to Christianity. We need to understand and appreciate the significance of the Ten Commandments — including their impact on our system government and their relevance to us still today. Last week U.S. Education Secretary Betsy DeVos criticized a “free speech” policy at Arkansas State University. You may recall nearly a year ago attorneys with Alliance Defending Freedom filed a lawsuit in federal court against Arkansas State University after the school attempted to suppress free speech by its students. ADF says the school has tried to limit speech to sanctioned “free speech” zones. 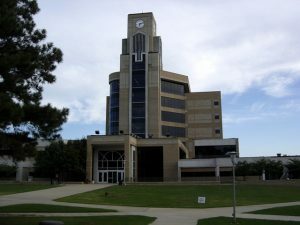 The university’s policy reportedly restricts free speech to 1% of its Jonesboro campus. When a student wanted to set up a table outside the student union to generate interest in forming a chapter of the group Turning Point USA on campus, a school administrator stopped her, citing the university’s speech policy. As the purpose of learning is forgotten, ignored or denied, we are inundated daily with stories of administrators and faculty manipulating marketplaces of ideas. Take what recently happened to a student at Arkansas State University. She wanted to recruit for a student organization she was founding, but soon learned it first had to be approved by the university. Even then, she still had to apply for a permission slip to distribute materials. And all of the activity had to occur within the confines of a “speech zone,” typically obscure, small, cordoned-off corners of campus where free expression is “permitted.” These so-called “free speech zones” are popping up on campuses across the country, but they’re not at all free. The Arkansas State student proceeded to set up shop, and was promptly removed by a university administrator and a campus police officer. She’s suing, and a judge recently allowed the action to proceed. College campuses used to be places where students could freely exchange ideas. However, we are increasingly seeing attempts by school administrators to restrict speech on campus — especially speech by conservative and pro-life students. Alliance Defending Freedom has an excellent track record litigating cases like this one in Jonesboro. Given that history, it seems likely the school’s anti-speech policies will not hold up in court.